After completing the Dalek project in week 1 as an introduction to modeling in 3DS Max we continued to develop into other key areas ; in weeks two and three our focus was texturing and UVW unwrapping. First of all on the second week we were given a small task to create a red telephone box from provided reference and texture it correctly, this was done by a process known as UVW Mapping. 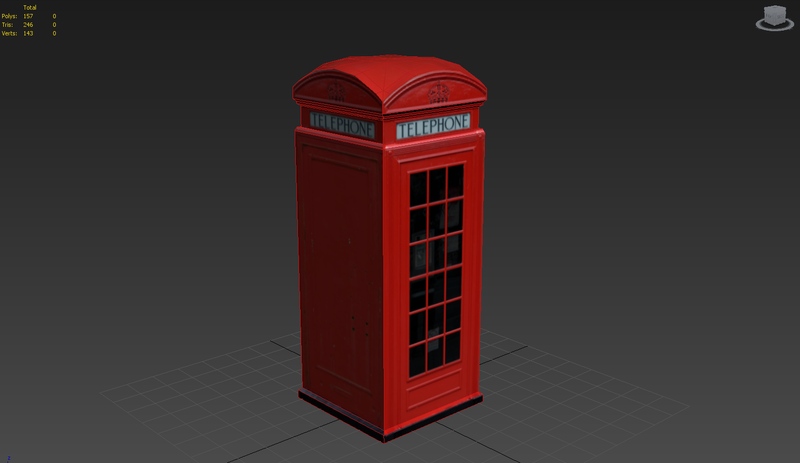 Red Telephone Box - 248 Tris. 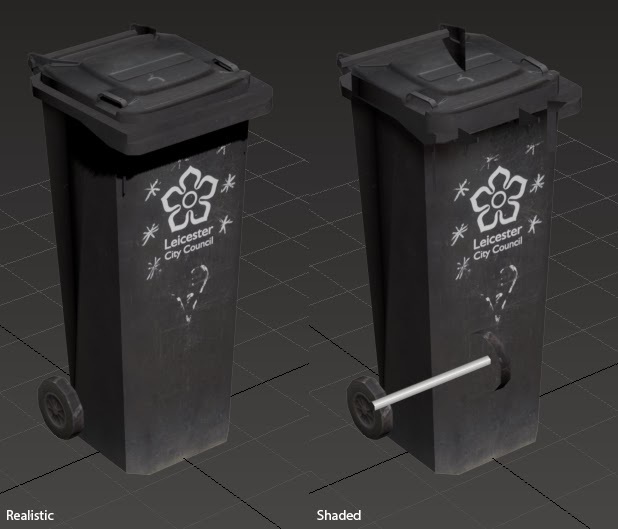 In our third week of Game Production we were set a task to create a wheelie bin asset using reference and textures gathered from the environment. We were told to create the wheelie bin within 600 tris and to utilise a 1024x1024 texture in a 32 bit targa format which utilizes alpha channels. I went out with some fellow course members to go texture gathering, we came across some bins just up the road from Bede Island and worked on gathering all the textures and reference necessary. We found a black bin first with the Leicester City Council logo on the front and gathered images from that. I also gathered images from another bin so I have the luxury of choosing a bin to model, the blue one was nice aesthetically but I preferred the black bin overall, also the handles on the blue bin looked really complicated to model when I purely wanted to focus on UVW and texturing for this project. 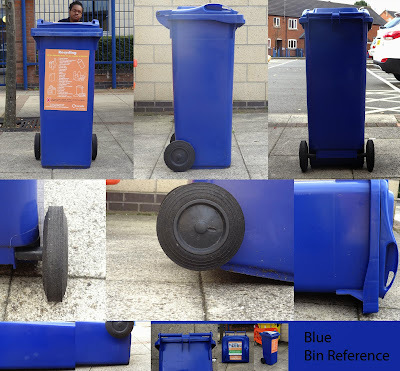 Blue Wheelie Bin - harder to model and in my opinion not as good looking as the black bin. 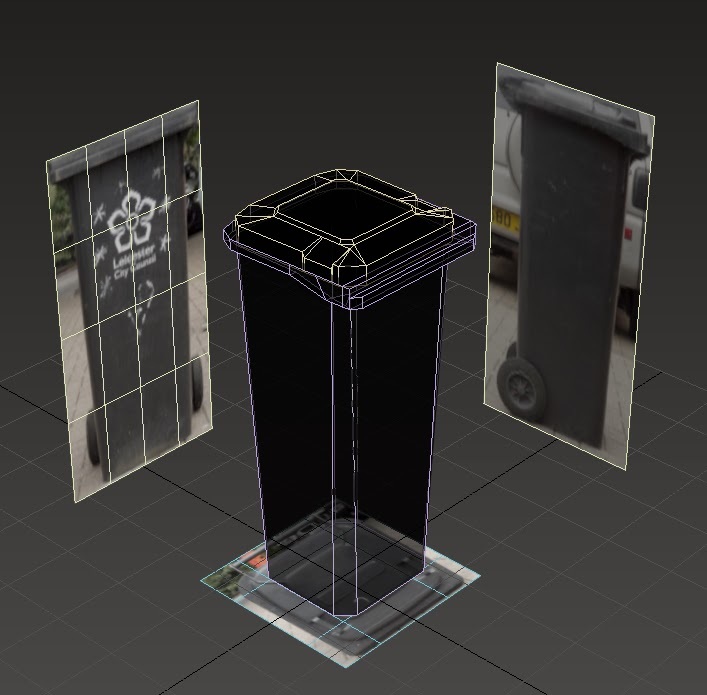 To start the process of modelling the Wheelie bin I set up my references in Photoshop by cropping unnecessary parts and resizing for import into 3DS Max. I applied from what I learnt in the Dalek project to do this. I started building the model by creating a basic cube primitive and modifying its shape according to the references. 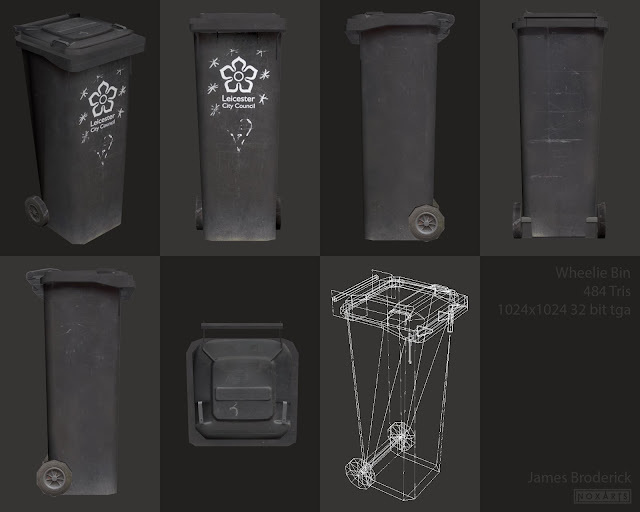 Bin basic model with references set up and transparent material applied. I also learnt a little trick for being able to see the inside of the model better using a transparent material instead of using the x-ray shortcut. 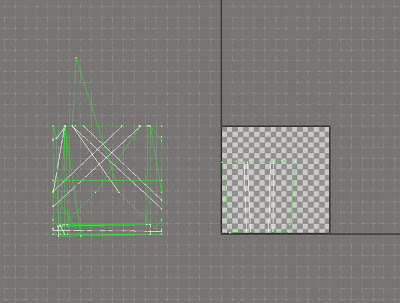 The problem with using the x-ray shortcut is if there are multiple objects or planes with the filter they stack up opacity and become nearly opaque so with using a transparent material instead I can control how transparent the object needs to be so I can see the entire model. I modeled the main section of the bin and the lid in separate parts so the mesh was easier to create. Also other details like the wheels and the little brackets under the lip were modeled separately. 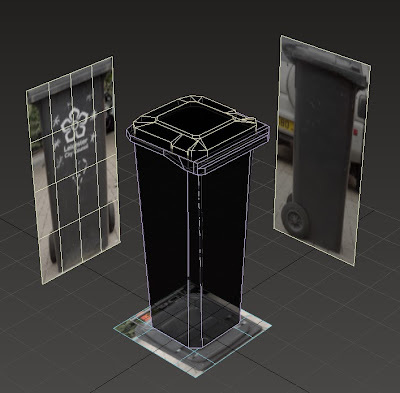 I finished the modelling stage and proceeded to texture the bin. first I selected all the faces and added a UVW modifier in the bin’s modifier stack in Max, I then opened the UV Editor so I can start to make edits to the UVs. UV Editor window, with some of the faces organised and the rest in a pile of mess on the left. I started off by unfolding most of the faces and organising them into the texture space. This was a long and tedious process that taken up most of my time, it’s an area I will look into in more depth on future models as correct unwrapping is an integral part of a quality model. During this stage I also cut down on some slightly more complex geometry at the hinges which was taking up too much texture space and helped me in the long run, at this point I didn't know about how the polys needed to be maximum 4 sides so I would have to come back and amend this later. 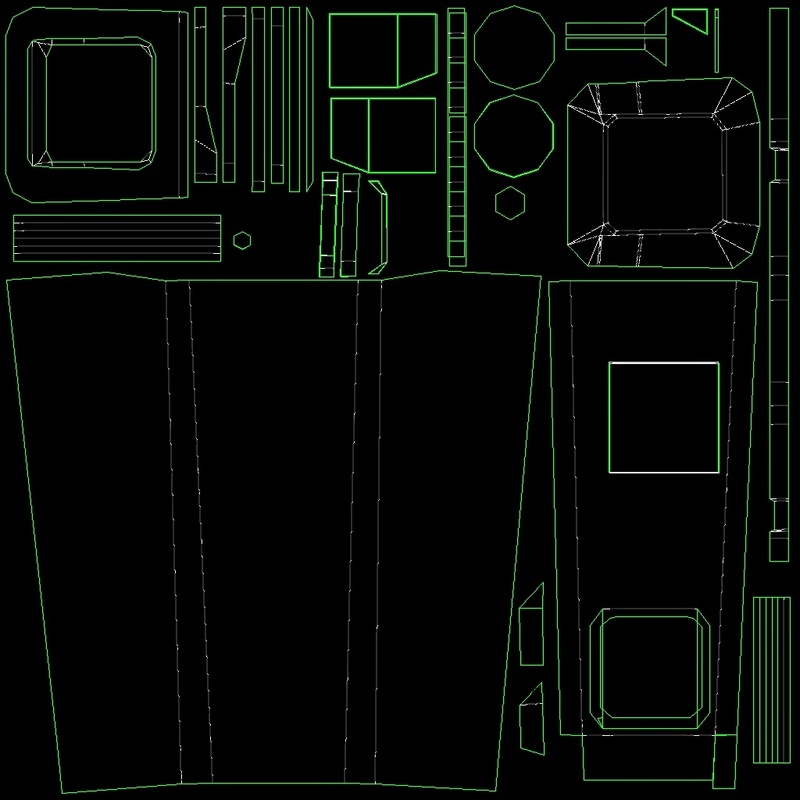 Below is my finished rendered UVW Template to import into Photoshop to create the textures, next time I will experiment with some of the more advanced options in the UV editor to help me create a simpler template as this one had a lot of separate components. 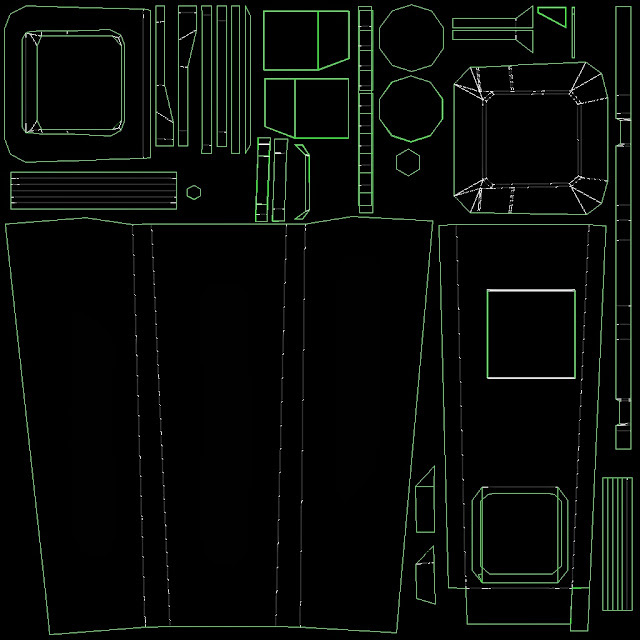 UV Template rendered out for use during the texturing stage. I brought the template into Photoshop and added it to a new layer set to screen so the black turns transparent, on a background layer I added a solid colour similar that of the bin to prevent drastic colour bleed. 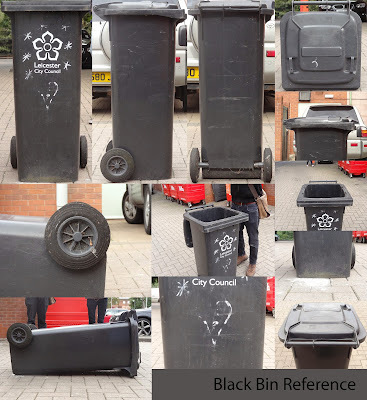 I got my 4 main photos of the bin from side, top, front and back and brought those in and started collaging them together according to the template. I used copy merge with alpha maps and clone stamp to get rid of seams and cover unwanted parts of the image as well as adjustment layers to balance out the colours. Above is my final texture sheet comprised of the various different elements collaged together. The wheels were of a slightly different colour so I placed them on a different block colour background. The shadows on the top of the bin sides were hard to link up and they still have come out quite blurred but now it will be something to think about next time as I get into texture painting more. I also created a little gradient for the wheel axle as the references I gathered didn't show it particularly well. It was at this stage I did some cleaning up on the model like getting rid of faces with more than 4 sides and all the unnecessary vertices. I played around with some of the smoothing groups to create a more solid form, this made an issue apparent with the sides where there appeared to be a triangle seam. I attempted to fix it through various methods but nothing seemed to work so I’ll look into troubleshooting videos and upload to Dmuga after so I can fix this issue and gain critique on my model. I also had a little issue with the rendering inside 3ds Max shortly before saving as some reason when switching to shaded mode some geometry shown through that wasn't supposed to. I fixed this by staying in realistic and turning shadows off which improved the rendering. Textures – Mike gave me some advice on my texturing, commenting that the directional lighting should be taken out as much as possible. 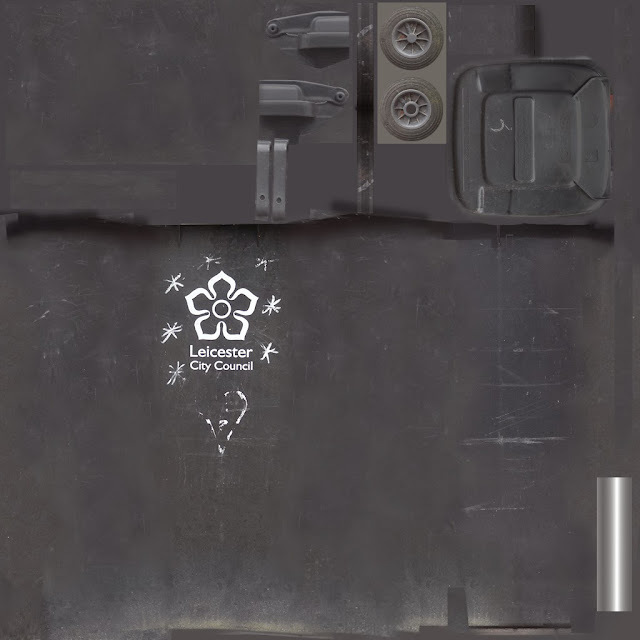 This is an area I will improve by looking at some professionally made texture sheets to see how they establish the form of the object without using too much lighting information. The lighting was noticeable a lot on my texture in my lid and under the lip of the bin where there was intense shadow from the texture. UVW Unwrap – The UVW unwrap is clean but pieces are very segmented, looking at some professional texture sheets I can see how they place the elements so I can see how it is done correctly. Now that I can reflect upon my model I can see where I need to improve, Polycount seems to be a quite knowledgeable resource I can take advantage of so my next step is to copy professional methods for modelling and apply them to my own work.